Using your cell phone to make free long distance calls at home on nights and weekends can save you money by enabling you to ditch your landline's long distance plan or get rid of your landline entirely. If you go that route, though, you can run into problems with poor reception in some areas of your home and uncharged batteries when you leave the house. Fortunately there are gateway devices that will solve both problems. Gateway devices let you use your cell phone service to make and receive calls with a regular home telephone. Some also connect to your landline service. the gateway routes the call to the attached regular phone. How does it work? You physically connect a standard telephone—either corded or cordless—to the gateway device with a phone wire and then pair your cell phone to the gateway via Bluetooth. When the gateway senses your cell phone nearby, it automatically pairs and starts routing calls through to the attached telephone. If more than one cell phone is paired, you can assign a different ring tone to each phone so you can tell which cell phone is ringing through. Outgoing calls dialed on the standard telephone are automatically routed through a paired cell phone. To resolve reception problems, set your cell phone to charge in a location that has the best reception possible and then set up the gateway device close by (no more than 20-30 feet away). And since you’re using your standard telephone for at-home calling, your cell phone will be fully charged when you’re ready to walk out the door. When you take your cell phone with you, there is no phone service in your home. If you use a landline during an emergency, the 911 operators will receive your location information when you call. Only e-911 call centers can receive the location information your cell phone sends, and the accuracy may be much lower. If you decide you still need landline service, you can find gateway devices which will also connect to your landline phone service. You can even connect an answering machine. 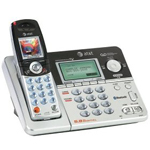 AT&T EP5632 5.8 GHz Digital BlueTooth Enabled Cordless Phone with Answering System ($90) This cordless phone with integrated answering machine works with 2 cell phones at a time. 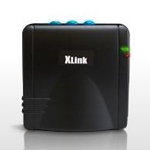 XLink BT Cellular Bluetooth Gateway ($99) Works with 3 cell phones at a time. 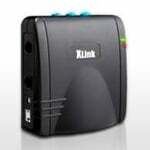 XLink BTTN Cellular Bluetooth Gateway ($119) Works with 3 cell phones at a time and passes through your home phone service.